The greatest mystery of the ancient world remains the identity of who set fire to the Great Library in Alexandria. One hundred years later, Heron of Alexandria—the city’s most renown inventor and creator of Temple miracles—receives coin from a mysterious patron to investigate the crime. Desperate to be free of the debts incurred by her twin brother, she accepts and sets in motion a chain of events that will shake the Roman Empire and change the course of history forever. Carpenter does a fantastic job in creating old Alexandria! 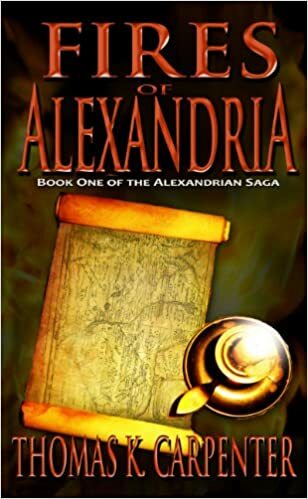 With sweeping descriptions of the city, detailed yet intriguing insight into people, their personalities and quirks to the court system of old, Carpenter excels in Fires of Alexandria. Taking liberty with history, we get a tale worthy of the title ‘Cult Classic’. With the title protagonist as a transman, pulling the wool over an entire city’s eyes, no less the top inventor who has her design’s stolen by an incompetent swindler, we see the inner workings of the master’s of illusion! There is slight political intrigue without boring us with typical details guaranteed to glaze our eyes over, we see how the machinations, of both people and machine, are bent to someone else’s will. Place is fantastic, much of historical descriptions become stale with each re-telling. Instead, we get dramatic descriptions showing us how people interacted with the ancient city, instead of just telling us someone walked over cobblestone streets. We get to cover many different areas of the city, meeting people of all sorts, just as in a real city with real people. People associate ares with emotion and a writer that evokes such emotions is rare indeed. My hat off to Carpenter, I give 5 stars!